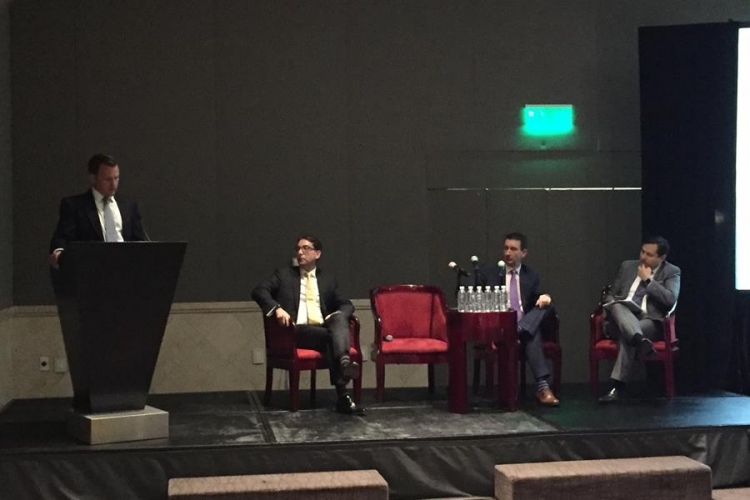 On Thursday morning, a breakfast-conference organised by ONTIER and the British Chamber of Commerce took place at the Presidente Intercontinental Hotel (Mexico City). The purpose of the meeting, attended by our British partners due to their visit to Mexico because of the V ONTIER convention, was to explore UK's horizon and new commercial opportunities that could arise for Mexico after Brexit. Our colleagues from ONTIER UK, Seamus Andrew and Paul Ferguson, together with Ian Cooper, Mexico country manager at Ylem Energy, analysed these issues. During his speech, Paul wanted to highlight that both the United Kingdom and Mexico are really attractive markets and therefore ''companies in both countries are exploring new collaboration possibilities''. On the one hand, he said, the United Kingdom is located at a great spot within Europe and has a less bureaucratic, more transparent system in comparison with other countries. On the other hand, he added, Mexico is now in full swing and it is expected to become one of the world's largest economic powers within 5 years. All of it makes it possible that excellent commercial and business opportunities increasingly arise. Regarding to Brexit, Paul acknowledged that there's still quite a bit of uncertainty but, at the same time, this makes it a great opportunity for Mexico to consolidate its relationship with the United Kingdom and for Mexican companies to redefine or even improve their strategy to approach the British market. ''I can't see a way that Brexit won't happen, therefore companies have to look forward. I am sure that after this period something great will come, something we must be ready for'', he said. For all that work and seizing of commercial opportunities, Seamus reminded the importance of having a strong legal system and with such great reputation as the British system has. London, he said, is just the ideal place for companies in Mexico and all over the world to solve their contentions and international disputes. The city ''is a neutral central spot totally prepared to lead international disputes, with hundreds of years of expertise and with a large number of experts, like former judges'', he concludes. Mexican and British businesspeople, as well as colleagues from the law firm who came to attend the V Convention, also came to the event, or breakfast-conference.